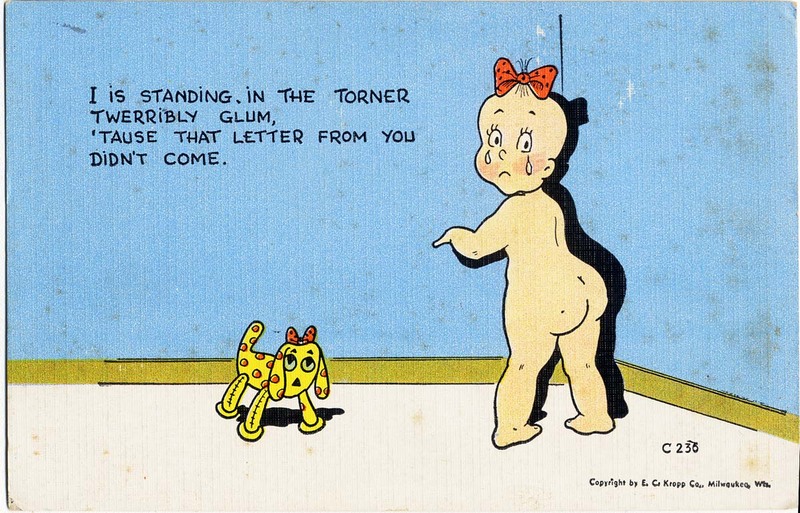 This unsigned postcard sure looks like the work of Dr. Seuss to me. That face is about as Seussian as it comes, IMHO. I find no info online, though, saying that Geisel did any postcard work, so maybe the manufacturer appropriated a drawing of his? This postcard was "Made in U.S.A by E.C. Kropp Co., Milwaukee Wisc., with code on the back "HJY #29203. I'm guessing it dates from the 1930s, but it is unused and there is no copyright date on it. I dunno. The text is certainly far below Seussian standards, and I would have guessed a more odd-monster like design for the creature. Opinions can vary, of course. Not by Seuss. Way too crude. Probably influenced by him, though. Yep, this is definitely not Seuss.